TI AVEVAMO PARLATO DI F.C. DORSUM, MA NON TI AVEVAMO FATTO VEDERE QUESTO OGGETTO/ACCESSORIO/ARREDO IMPERDIBILE (CIAO SUPREME). DECIDI TU COS’E’, NEL SENSO CHE PUOI SMONTARE LE GAMBE E USARLO COME SKATE OPPURE COME PANCHINA PORTATILE PER STARE COMODO AI CAMP OUT, OPPURE ANCORA PER FARCI UN PIC-NIC SUL TAPPETO DI ERBA ARTIFICIALE DI ALTISSIMA QUALITA’ (CI TENGONO ABBASTANZA A PRECISARLO) CHE NE RICOPRE LA SUPERFICIE. 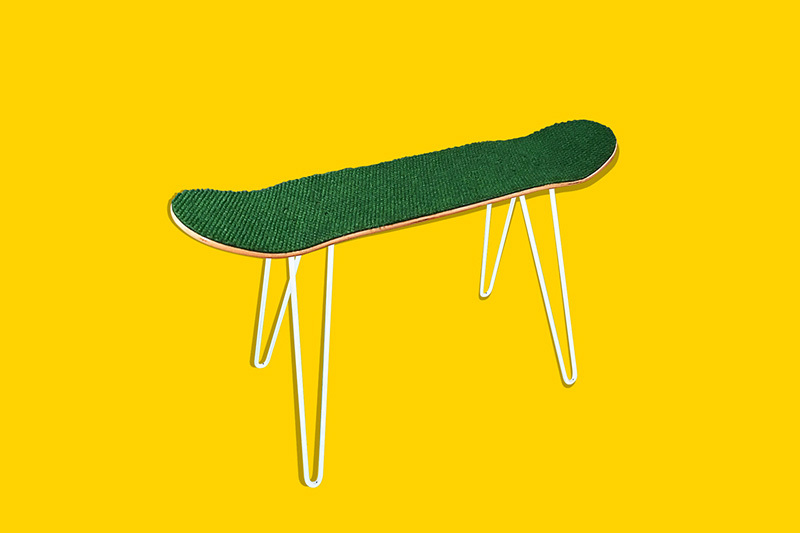 Hey, we’re not really sure whether this is a bench or a side table because we’ve used it for both, but what we do know is that, it is a cool skateboard because it has artificial turf on it. But it’s not the cheap plastic ones that your dad practices his golf putt’s on, but the soft carpet ones. VABE’ E’ UN OGGETTO INDISPENSABILE.